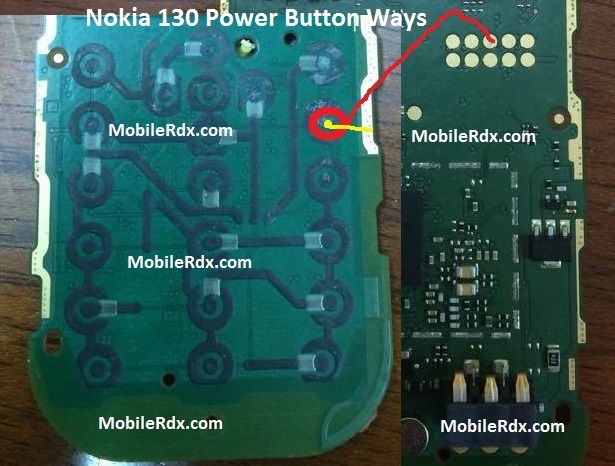 Here’s the solution to repair Nokia 130 Dual SIM power ON/OFF switch problem. This problem may cause the device unable to power up when hitting the power key. The problem may easily configured if the power ON and OFF switch key has no response, but the device is not totally dead for it shows a charging indication when you charge it up. Now, this solution simply shows the line paths (ON OFF ways)of the power key. If you are facing an power problem in Nokia 130 diagrams in this article can help. Continue with the following troubleshooting solutions and establish bridges necessary for the points that have been damaged. The very first thing that you need to do is to check battery voltage at its terminals in order to verify whether the problem is with the battery or with anything else. (Battery voltage should be at least 3.8V). If the battery voltage is lower than 3.8V or is not showing charge then it means you need to change your battery in first place and check. If any of the on/off switch + or – track missing then make a jumper.